There's no question that dividend-paying stocks have become more popular in recent years as interest rates on fixed income and savings products declined. Indeed, dividend-focused ETFs and mutual funds have experienced strong inflows, some higher-yielding stocks in rather staid industries (tobacco, utilities, etc.) are trading with multiples above their five-year averages, and gross S&P 500 dividend distributions will almost certainly hit a record high in 2012. Contrarian investors will naturally raise an eyebrow or two at these developments. The heightened interest in dividends has led to some speculation that a "dividend bubble" might be afoot. As you might expect, massive debate has ensued among pundits, normally with the author taking a firm and uncompromising stance on one side or the other. Instead, I find it far more instructive to critically examine the landscape as it stands today without being handcuffed to the bubble framework. Is there "irrational exuberance" for dividend-paying stocks today? Relative to the exuberance we saw with dotcom stocks or housing, absolutely not. If there were, I don't think you'd see this trend in U.S. payout ratios. It stands to reason that if investors really were falling over themselves to buy dividend stocks, companies would respond by paying out a greater percentage of earnings as dividends, so as to attract more investor interest. While some companies may have accelerated their dividend payouts for this reason, on average, that's not happening. Instead, S&P 500 companies used buybacks over dividends to return cash to shareholders by nearly a 2:1 ratio in the second quarter. 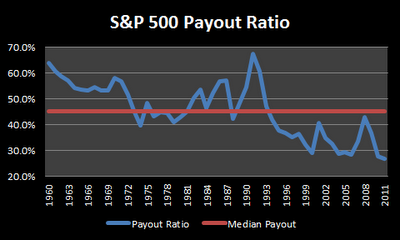 The trailing 12-month S&P 500 dividend payout ratio stands at just 32%. Might some institutional investors be using buybacks to 'create' their own dividends? Maybe, but you could have just as easily have made the case for that in 2007 when dividends certainly weren't in style. And yes, aggregate dividends of $67.31 billion in Q2 2012 set a record -- finally eclipsing the previous record of $67.09 billion set in Q2 2007. Flat nominal dividend growth over the course of five years is hardly an indication that corporations are opening the spigots to satiate investor appetite for dividends. Are some dividend-paying stocks overvalued today? Yes. Judging by the multiples on some low-growth, high-yielding stocks today, I think it's likely that income-thirsty investors have in some cases reached for yield and bid the share prices above their fair value. Similarly, so-called "quality" dividend-paying stocks -- that is, stocks with long track records of raising payouts each year (Aristocrats, Achievers, etc.) and investment-grade balance sheets -- as a group seem to be fully valued. Are all dividend-paying stocks overvalued today? No. I think there's likely more value to be found in the lower-yielding areas of the market, as investors who are solely interested in current income are focused on the higher-yielding stocks and may not have the time horizon or interest to wait for the dividend to grow over time. Where might there be value left among dividend-paying stocks? Investors who have just started building a dividend-focused portfolio are not likely to find many deep value opportunities in the high-yield or traditional "quality" space right now. The most fertile ground for moderate- to high-yielding stocks today is likely found in stocks that have just recently started paying dividends (as they're not yet included in Aristocrat/Achievers screens and trackers), stocks that may have cut their payouts during the financial crisis but are on the path to recovery, and in smaller-cap stocks where the large funds are less likely to hunt for yield. 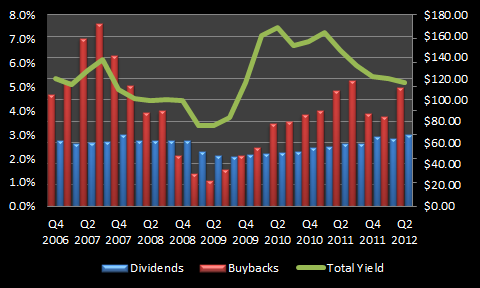 While there isn't a dividend "bubble", I will say that most of the low-hanging fruit has been picked. As such, you'll need to do a little extra homework if you hope to land some undervalued dividend-paying stocks with relatively good yields right now. It's no longer as simple as picking 12-20 stocks that everyone knows with investment-grade balance sheets and decades-long dividend track records. Yet there are still opportunities out there for investors willing to do the extra work. As always, stay disciplined and patient out there. Should We Do Away With Dividend Yield?